Services: Hand lettering, mural design, hand painted mural, hand painted logo. 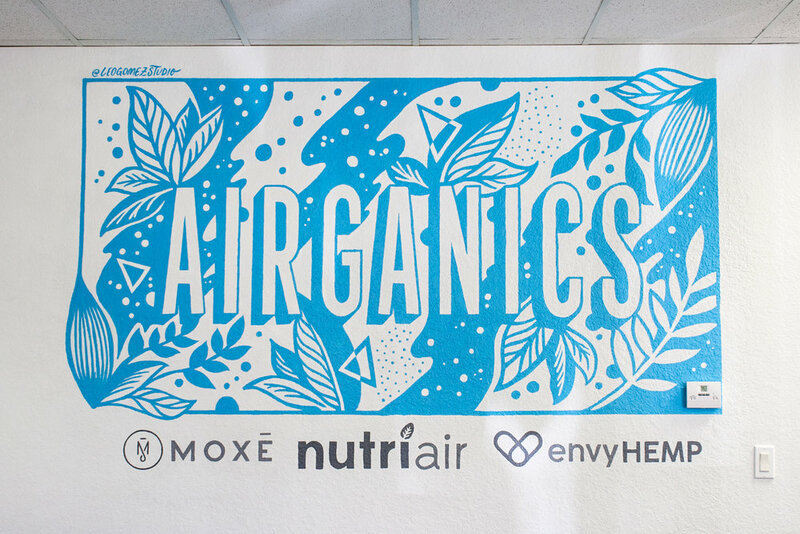 Mural design and installation for Airganics - A company delivering inhalable nutrients. Hand painted in monotone for a soft and subtle look and feel inside their office space in Clearwater, FL. In addition to the mural, the logos of the 3 brands under this company were also hand painted. The concept design represents the action of inhaling or breathing in, organic elements and science in an abstract quality. The use of florals illustrations and abstract shapes to create a balance between the two opposites, pure blue and pure white. The circles or air bubbles, creates sense of dynamic movement, making the whole piece feel alive as opposed to static.